UPDATE: You can now see video of the entire session. It wasn’t that long ago that Research in Motion defined smartphones: You either owned a BlackBerry, or your phone wasn’t smart. Fast-forward to present tense, though, and it’s a different story. Depending on whom you talk to, RIM has either been passed by Apple’s iPhone, or is about to be. Google’s Android is coming up just as fast, too. RIM is trying to fight back with new phones that look a lot like the competitions’, and by venturing away from phones altogether, with its new PlayBook tablet, too. Will that work? 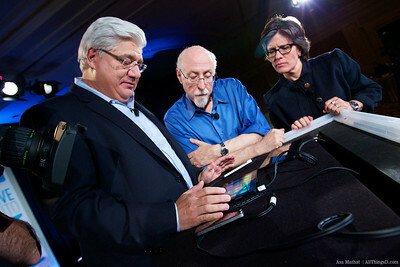 Co-CEO Mike Lazaridis makes his case to Walt Mossberg and Kara Swisher. Mike Lazaridis shows up onstage with a PlayBook. He’s walking through various apps. Switching quickly between HD video, different apps, via multitasking. At 7 inches, “it’s just the perfect size”, says Mike. So no plans to make it in a bigger size, asks Walt. [Pause] We have plans for different sizes, says Mike. Time to sit in the comfy chairs. When is this launching? “Tracking first quarter”, says Mike. Walt asks if PlayBook system will migrate into BlackBerry. Walt cuts him off: There’s a growing consensus that BlackBerry is “looking old compared to some of the other platforms.” So: If PlayBook is future of the BlackBerry, when does this OS get there? Kara Swisher is also confused. So does the tablet become the phone? Mike tries another tack, talking about BlackBerry in worldwide markets. In 2G markets, it’s becoming dominant. Also successful in 3G markets. Walt is confused as well. Are you saying that you essentially stop paying as much attention to improving BlackBerry phones, and put next generation of tech into tablets? 4:37 pm: Colleague Ina Fried has a post up with more on the PlayBook over at her Mobilized blog..
Mike: “Rather than trying to be all things to all people,” we can present the best product for the market or the situation. The three: Phones, superphones and tablets. “But it’s not going to happen overnight. And you have to think about this as a global player,” and you can’t abandon markets that don’t have 3G or 4G, and that can’t afford high-end stuff. “So all of this will be called BlackBerry”? Asks Walt. Yes, says Mike. Kara: Talk about Apple and Google, please. And do you think BlackBerry lagged? What happened for you? Mike: “We were focusing on a global market,” and as a result, BlackBerry is becoming No. 1 around the world. Strategy for the future, etc. Mike: Apple and Android are trying to take a mobile phone OS and upgrade it for a tablet. We’re starting with a bona-fide mobile computing platform for tablets. Kara: How do you react to all the stories burying you? Mike: We’ve been at this a long time. Goes on to explain his history. Kara: “Not in Sumatra,” but here, in the United States. Mike: We’re running a business. We invented the smartphone. We decided to go global. Walt: So did you decided to chain yourself to lowest common denominator technology? Mike: Technical discussion of multicores. Says competitors learning how big a market there is. We built our own technology, etc. Kara: Back to the competitive landscape, please. Mike: Focusing on strength–enterprise and security. Military, police, etc. Reliability and security. Walt: So why are you running all these consumer ads? Walt: Here’s the problem with enterprise–plenty of professionals now want to pick their own phones, like Apple and Android. Kara: Please rank your competition. Mike: We’re the best, of course! Walt: OK, so that’s a differentiator. But Apple is selling lots of Flash-less tablets. Walt: Price? Mike: No answer. And when will the Playbook OS get into phones? ML: No real answer. Can you update us on BlackBerry 6 OS in the market, and how are you doing at attracting developers? Q: I really don’t think my Torch is as fast and good as you say it is. Mike: Seems to be arguing that phones limited by battery issues. Q: Consumers say security isn’t important, until it is, right? Q: You bought The Astonishing Tribe. What’s the plan there? Done. Thanks and good night! Drinks upstairs!